Product #18304 | SKU ELITE | 0.0 (no ratings yet) Thanks for your rating! The IDX ENDURA ELITE offers a 9.2Ah, 136Wh capacity to support the higher loads of HD cameras. It also features a dual cartridge system specifically designed to meet transportation regulations for domestic and international travel. Two identical PC-14 power cartridges are housed inside the outer casing of the ELITE. This design allows for an easy exchange of cartridges, reducing the cost of replacement batteries. The ENDURA ELITE is IATA approved for unrestricted carry-on airline carriage. 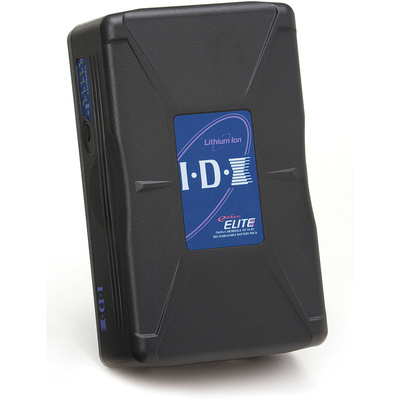 At 9.2Ah/136Wh the ELITE is the only lithium-ion battery over 100Wh that is IATA approved. Each PC-14 Power Cartridge can be disengaged and stored separately prior to flight. Digi-View gives the camera operator an accurate display of the ELITES's remaining capacity, shown via the camera's viewfinder. Five LEDs are located on the side of the ELITE with 10 settings to display remaining battery capacity. This is done in increments of 10% by full/flashing combination of the five LEDs. Battery circuit protection ensures the ELITE is fully protected against common causes of battery misuse, guarding against overcharge, over-discharge, overcurrent, and exposure to high temperatures. This high level of protection is built into both PC-14 power cartridges. The ELITE can be charged using IDX sequential or simultaneous ENDURA chargers (VL-2SPLUS or VL-4S series).